Tredington and District Garden Club meet on the third Thursday of the month as detailed in the programme. 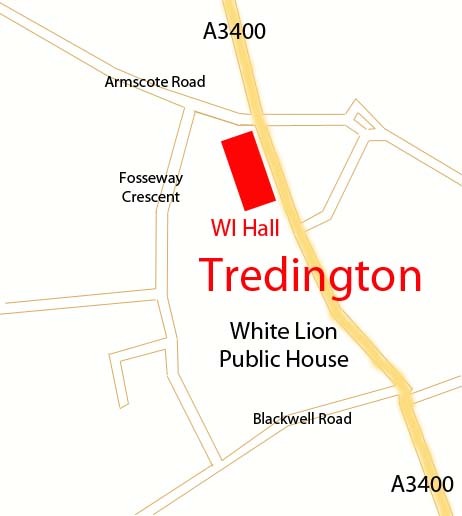 Tredington, Warwickshire, CV36 4NL (on the corner with the A3400). See map below for location of the Hall. Each meeting typically involves a presentation of between one and one and a half hours in length with the opportunity to ask questions associated with the subject. Light refreshments are served after the presentation. There is also a raffle with tickets on sale at the start of the evening. The club also arranges a number of other events and visits, for example to local gardens of interest. Full details of these events are announced near the time of the visit. Tredington and District Garden Club is affiliated to the Gloucestershire Federation of Gardening Societies.